We’re thrilled and proud to be able to link up with Lotus Tarot, probably the best Tarot Reading site on the internet today. By clicking on the link below you will be taken to Alison Day’s site, where you will be able to access free online readings and lots of other tarot related information, including a free learn tarot course, articles, an active discussion forum, card interpretations and loads of links to other great stuff. To get a free reading, you will need to register your email address with the site, which takes about 30 seconds and is more than worth the effort – Alison’s readings are both accurate and upbeat. 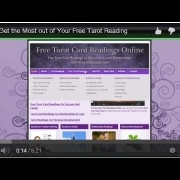 Click here for tarot readings for free at lotus tarot.